Located at just three hours drive away from Jammu, Patnitop is a place heavily discovered by the tourists. 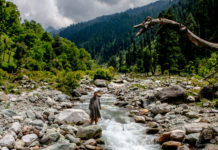 This most favourite tourist destination of Jammu is located in the Lower Himalayan Range close to the Pir Panjal range, 47 km from Udhampur and 112 km from Jammu and is perched on a beautiful plateau, at an altitude of 2024 m across which the Jammu-Srinagar Highway passes. Once in Patnitop, just sitting under the sun in the green meadow dotted with tall conifers can be the highlight of one’s holiday. The lush wooded forests around offer ample opportunity for trekking and a rich selection of scenic spots for picnics. A walk on the kutcha (unpaved) paths between rows and rows of tall trees leads to quiet retreats and excellent views of the pine-covered mountains. The only sound one hears is the tinkling of bells around the necks of goats and cows and the rustling of leaves and twigs as one walks in a dream world of his own. Patnitop does not offer opportunities to shop. 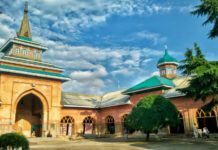 For really compulsive shoppers, a few kiosks are located beside the meadow selling Kashmiri specialties- handicrafts, namdas (embroidered wool carpets), pherans (embroidered long shirts) and woolens. The towns of Kud and Batote are nearby. Kud is a very small town where sweet shops make fresh Patissa (a sweet). It may be bought hot and melts in one’s mouth. Batote is known as a place for quality rajma or the kidney bean. Gourikund: This is the position where it is considered that Devi Parvati, the goddess, comes and bathes every day before her wishes. This is a recognized position. Taking a dip in the sacred water of this holy Gaurikund is expected to keep away all the bad fortune. From the area of Gaurikund, visitors can see the top of holy Kailash Parvat (peak). Sudh Mahadev Mandir: Believed to be 2800 years old, the temple of Sudh Mahadev houses a natural black marble Lingam, the Trident (Trishul) of Lord Shiva and mace believed to be that of Bheema, one of the five legendary Pandava brothers. This holy temple near Patnitop is situated at an altitude of 1225 m and is about 120 kms from Jammu. Pilgrims visit the shrine on Historic Sudhmahadev 3 day Festival (Mela) on the full moon night of ‘Sawan’ (June -July) to worship the Trident (Trishul) and a mace. During this 3 day festival, arrangements are made by the state government administration to provide facilities to the visitors. Adequate transport is also provided by the government agencies from various destinations. The government also ensures security arrangements. Good health facilities are also made available. Cultural programs are organized during the 3 day festival; in which the local performers entertain the visitors by showcasing various local dances and singing folk songs. Another 8 kms from Sudhmahadev is an enchanting hill resort of Mantalai. Located at the top of a hill and surrounded by tall Deodar trees giving fresh and cool air. It is believed that Lord Shiva and Goddess Parvati got married there. There is a Shiva temple with a pond by its side. Shivgarh: This Place Acts As A Good Starting Point For Short And Long Treks To The Nearby Mountains. The One-day Walk To Shiva-Garh At An Altitude Of 3,500 M, Which Is About 11 Km Away From Patnitop, Is Quite Exhilarating. Also There Is A Rich Selection Of Peaceful And Scenic Spots For Picnic Lovers. The Only Sound One Hears Is The Tinkling Of Bells Around The Neck Of Goats And Cows And The Rustling Of Fiber And Twigs As One Walks In The Lush Meadow In A Dream World Of Ones Own. The Walk In The Unpaved Path (named Kutcha) Between The Rows And Rows Of Tall Trees Leads To Quiet Retreats And Excellent Views Of Pine-covered Forest. The Beautiful Paths Passing Through Wooded Lanes And Fascinating Scenery Links Patnitop To Kud And Batote. Travelers Can Also Visit Three Springs, Gushing With Ice-cold Freshwater. 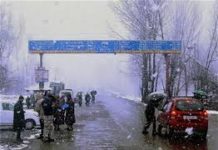 Udhampur: Udhampur is a district in the Indian state of Jammu and Kashmir. Udhampur town is the headquarters of this district. Pine Forest: Pine forests offers beautiful picnic spots, peaceful walks and breathtaking views of the mountainscape of the Chenab basin. In winter, the resort is generally covered with a thick mantle of snow thus providing opportunities for various snow games including skiing. Engraved Stairs: This takeoff site is at Dawariyai, on the Patnitop-Sanasar road. The area often called as the Billoo Di Powri point. Approx 400 plus steps have been carved out along the rock face to make the steep slope negotiable. The stairs eventually leading to Dawariyai, the “gateway”. The exact dating of the work is still debatable.